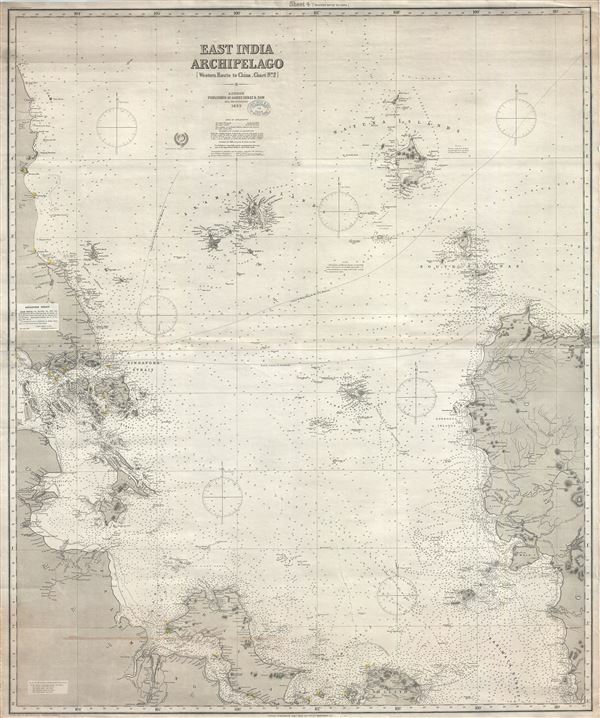 Impressive nautical chart detailing Singapore. A large and impressive 1891 nautical chart by James Imray covering eastern Malaya (Malaysia), Singapore, and parts of Borneo and Sumatra. This is part of a nine-map series Imray issued to illustrate trade routes between Singapore, China, and Japan. It corresponds to Chart no. 2 in the 'East India Archipelago' series and chart no. 4 in the 'Western Route to China' series. This chart was first issued in the 1860s. The current edition is 1893, but has been updated and corrected to 1894. The actual printing was in 1894. Good. Blueback. Imray's stamp near title. Some edge wear. Large tear extending from bottom center about 10 inches into page. Repaired on verso.